Navodaya or Jawahar Navodaya Vidyalayas (JNVs) are a system of alternate residential schools for students (6th -12th grade) in India run by the Central Government. The students who are selected through an entrance examination are provided with all the facilities and education free of cost. The system has helped many students to make wise career choices and pursue their higher education dreams after graduating from the school. However, this is not possible for every student who finishes high school from Navodaya. Unfortunately, many talented students owing to their financially disadvantaged background make poor career choices or end up in odd jobs. The Navodaya system has created thousands of successful people who are spread across the world and has influenced every Navodayan in one way or the other. Why not pay it forward? The simple act of helping someone in need expecting nothing in return is the guiding principle of Paying It Forward @Navodaya project. 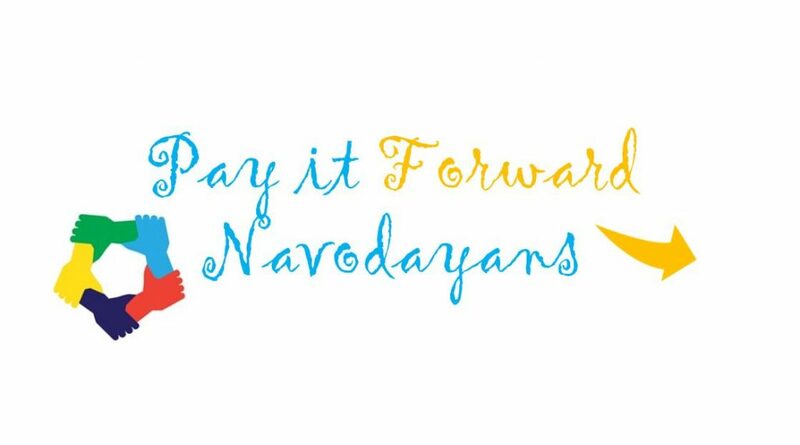 This project aims to inspire successful global Navodayans to help younger Navodayans with scholarships and career guidance to pursue their higher education dreams. When the recipient does the same for someone else in the future, the cycle of help will continue to another generation of Navodayans. “Come in to learn, go out to serve” – this is what you will see when you enter the Navodaya main academic building across India. The schooling system in Navodaya has helped us all a lot in terms of learning and preparing for the outside world. However, the world outside Navodaya is a lot more competitive, and not every Navodayan is equipped to face it. Once outside Navodaya, everyone is on their own, and this is where the financial position of their family and connections play a role. Some of these teenagers don’t have a choice when it comes to higher education due to the family’s financial position. In many instances, the family would be struggling to meet the ends. As a result, higher education doesn’t become a priority, and many capable Navodayans are forced to give up their higher education dreams. Some of them end up in odd jobs or even get married before they are ready. Our goal as alumni is to guide and assist as many Navodayans as possible through scholarships so that they have a choice and lead a successful life. The society in turn receives passionate professionals to serve its people. It’s a win-win situation. This is a massive project in scale but could be managed locally (just the way JNVs are run). We have analyzed similar programs and have created this rough action plan/process including FAQs. ₹ 1000-1500 (Roughly $25 a month ~ $300 a year). How do we identify donors? How much should donors give? Donors may sponsor 1 student ($25 a month ~ $300 a year) or more than one student. A donor may also elect to utilize his/her donations for a particular school or region of his/her choice. The donor will be made aware of which student he/she is supporting. How do we identify scholarship recipients? Students should submit a scholarship application through I-Believe website. The online form is located here. Once the application is submitted, a selection committee of 5-7 global and local Navodayans will review the application and approve them within 30 days. This process will allow us to create a database of qualified and eligible students. This process will also enhance transparency and efficiency of this program. A donor is likely to support a student from the same JNV he/she attended. The committee will assist him/her to identify a recipient from his/her school in that case. If a donor elects to donate to the common fund, the committee will choose the best candidate from the database of qualified and eligible students previously created. How can we keep this program transparent? Benefactors will have information about the recipients who receive the scholarship. Donors are also encouraged to stay connected with the recipients. Apart from transparency, this will also help donors stay informed about the progress the students make and to guide and inspire them. Finalizing the committee. We have around 20+ Navodayans who have expressed interest in becoming donors. We truly hope this number to grow to 25 this year and to 50-100 in 2018. Are you a Navodayan and would like to support? We believe success is measured by the lives we impact. We can’t do it without you, so we’re asking you to get involved. Please email globalnavodayan@gmail.com or use the buttons below to explore ways you can support this project.